I love won ton soup, actually, I love won ton broth! A perfect combination of standard chicken soup broth, garlic and soy sauce. I have been know to browse the Asian bar at the local supermarket and walk away with a pint of won ton broth loaded with scallions. I believe it cures the common cold. And since I'm about to loose my health insurance due to the election results, I'm looking for natural alternatives to prescribed medications. Seriously. Stocking up on ginger and cinnamon. Anyway, since I'm a fan of the broth and not so much the thick ravioli-style won ton, I have adapted many other variations including adding fresh lemons or, my absolute favorite, fresh seafood. Within walking distance to my home, (literally, if there wasn't a fence I could walk 70 yards and be in its back door) there is a Japanese restaurant that features a seafood soup that blows me away every time I order it, which is often. It also comes with a small vial of a very hot spice mixture which I add sparingly. I don't know what is in it-and they are not talking (well, they are talking but I didn't understand). But whatever it is, will clear your sinuses like nothing else I know of. 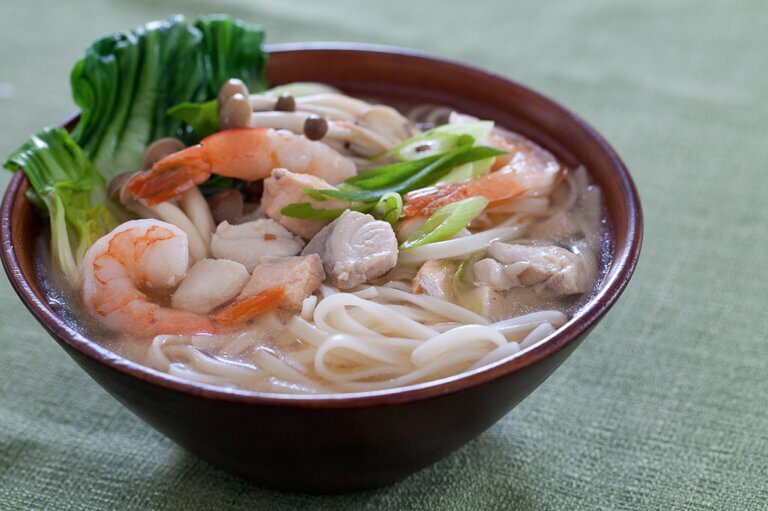 What I like about Asian style soups is that their broths are not thick, creamy and loaded with starch. I love clean, sometimes clear, broth which the Asian culture has mastered making amazingly flavorful. As a matter of choice, when I make the standard, American style chicken noodle soup, I cook the noodles separately so they don't thicken my broth as they cook. I'm that serious about a clean broth. My favorite adaptation of that Japanese restaurant's famous soup, is listed below. It is a quick meal on a cold night, and when served over cooked noodles, can easily be made into a healthy, tasteful entree. 1. Heat oil in a medium saucepan over medium heat. Add garlic and stir until golden, about 1 minute. Add cabbage and 1/4 cup of the broth. Bring to a simmer and cook until the cabbage is wilted, about 1 minute. Add the remaining broth, shrimp, scallops, soy sauce and vinegar. Return to a simmer and cook until the shrimp and scallops are opaque in the center, about 1 minute. 2. Meanwhile, cook noodles in a large pot of boiling salted water just until tender, 2 to 5 minutes. If using linguine, cook until al dente, 8 to 10 minutes. Drain in a colander and divide among 4 large soup bowls. Ladle the soup over the noodles and sprinkle with scallions. n And nothing pairs better with a light soup than a salad with citrus dressing. I have been using lemon and olive oil as my dressing base for years, the recipe below just kicks it up a notch. So mix up your favorite greens and whip up the ingredients listed and dinner is served.